Economists often point out the benefits of trade, yet empirical evidence for these benefits has been hard to come by and tends to be recent. This column goes back to the first millennium BC to analyse the growth effects of one of the first major trade expansions in human history: the systematic crossing of the open sea in the Mediterranean by the Phoenicians. A strong positive relationship between connectedness and archaeological sites suggests a large role for geography and trade in development even at such an early juncture in history. The effects of free trade inspire a lot of public debate these days, and policies to restrict trade are gaining in prominence. Economists since Adam Smith and David Ricardo have typically pointed out the benefits of trade. Yet empirical evidence for these benefits has been much harder to come by and is much more recent. In particular, empirical economists have tried to demonstrate that more open economies or more integrated markets see faster growth. The relationship between these two variables is not much disputed; the more difficult question is whether this is due to trade causing growth or richer economies being more open. A number of recent studies have made some headway on disentangling causality – mostly by drawing on historical episodes related to the opening of new trade routes or the introduction of cheaper trading technologies. A pioneering study by Redding and Sturm (2008) looks at the growth of German cities when the country was divided after WWII. This meant that West German cities near the new border lost part of their hinterland and access to East German markets. They find that these border cities indeed grew slower during the time of division. Other studies have looked at the impact of new transport technologies. Donaldson and Hornbeck (2016) study the impact of the expansion of railroads in the US between 1870 and 1890 on agriculture. They conclude that the value of agricultural land doubled due to the presence of the railroad network. The expansion of the US highway system, starting a century later in the late 1950s, led to retail sales about 10% higher in counties near highways compared to those further away, as Michaels (2008) demonstrates. During the same period, air freight began to connect landlocked countries closer to their trading partners. Feyerer (2009) finds that a 10% increase in trade induced by air transport raises income by about 5%. In a similar vein, Pascali (2017)exploits the fact that the introduction of steamships during the 2ndhalf of the 19thcentury provided advantages on certain trade routes and less on others, depending on how well prevailing wind patterns allowed sailing ships to serve these routes. Pascali’s findings are more sobering and less in line with the simple economic benefits of trade: trade had negative effects on most countries and only benefited those with more inclusive political institutions. These episodes are still fairly recent, and it is natural to ask whether the economic consequences of trade are limited to the period since the height of the industrial revolution. What if we delve deeper into history? Trade seems to have played an important role long hence. Acemoglu et al. (2005) link the opening of Atlantic trade starting around 1,500 AD to the ensuing shift in the focus of economic activity in Europe from the south and centre of the continent to the Atlantic periphery: France, the Netherlands, and England. In a recent paper (Bakker et al. 2018), we go back even further and explore this connection in the Millennium before Christ. We analyse the growth effects of one of the first major trade expansions in human history: the systematic crossing of the open sea in the Mediterranean by the Phoenicians. Seafaring in the in the Mediterranean started with hunter-gatherer societies around 10,000 BC; we know that humans began to settle islands at that time (Broodbank 2006). They also moved obsidian, a volcanic rock, over considerable distances. With the advent of the sail around 3,000 BC, ships had a considerable cost advantage over land transportation. Regional trade networks grew in importance in the Mediterranean during the next two millennia. However, most of this sailing was coastal. While sailors made open sea crossings where they were difficult to avoid, for example to reach Cyprus, Crete, or to cross from Albania to the heel of the Italian boot, coast hugging prevailed elsewhere. Only from around 900 BC did Phoenician and other sailors begin to systematically and routinely cross the open Mediterranean. A dense trading network began to emerge, and on the eve of classical antiquity, the Mediterranean was constantly criss-crossed by Phoenician, Greek, and other sailors. This was an expansion in scale and scope far beyond the trading activities which went on before. The house mouse is a marker for the magnitude of this expansion. Originating in South East Asia, this species reached the eastern seaboard of the Mediterranean around 12,000 BC. From there, it slowly veered into Southern Anatolia and Northeastern Africa during the next 10,000 years. By 1,000 BC it had barely spread to Greece. Then, with the intensifying maritime connections across the Mediterranean, the mouse rapidly appeared all over the Central and Western Mediterranean (Cucchi et al. 2005). To analyse whether this increased trade also caused growth, we exploit the fact that open sea sailing creates different levels of connectedness for different points on the coast. The shape of the coast and the location of islands determineshow easy it is to reach other points, which might be potential trading partners, within a certain distance. We create such a measure of connectedness for travel via sea. Figure 1 shows the values of this measure on a map and demonstrates how some regions, for example the Aegean but also southern Italy and Sicily, are much better connected than others. We use this measure of connectedness as a proxy for trading opportunities. Note: Darker blue indicates better connected locations. Measuring growth for an early period of human history is more difficult as we have no standard measure of income, GDP, or even population. We quantify growth by the presence of archaeologic sites for settlements or urbanisations. While this is clearly not a perfect measure, more sites should imply more human presence and activity. We then relate the number of active archaeological sites in a particular period to our measure of connectedness. We find a large positive relationship between connectedness and archaeological sites. The effect of connections on growth in the Iron Age Mediterranean are up to twice as large as the effects Donaldson and Hornbeck (2016) found for US railroads. Although these results are unlikely to be directly comparable, the magnitudes suggest a large role for geography and trade in development even at such an early juncture in history. When we repeat our analysis for different points in time, we find considerably smaller effects in the 2ndmillennium BC and then a sizable increase from 750 BC onward. While this is consistent with the increased trade activity during the Iron Age, we caution that the archaeological data for the earlier period are sparser and appear less reliable. The effects of connections peak around 500 BC and then become weaker. The weakening of the effect of connectedness during the height of the Roman Empire, which stretched across the entire Mediterranean, may seem puzzling. It may be due to new settlements emerging between 900 BC and 500 BC being in the best-connected locations, while new cities later arose in worse-connected locations. We find some evidence for this while at the same time the best-connected cities persist. This is consistent with a large literature on the persistence of city locations (Davis and Weinstein 2002, Bleakley and Lin 2012, Bosker and Buringh 2017, Michaels and Rauch 2018 among others). While we have the most systematic data on archaeological sites for the Mediterranean, we also explore whether we can find similar effects at a world scale. For this exercise we use a measure of population density in the year 1 AD, constructed by economic historians McEvedy and Jones (1978). This measure varies only at the level of modern countries, so we also aggregate connectedness to the country level. As Figure 2 shows, there is a strong positive relationship between a country’s average connectedness and its population density in year 1 AD as well. 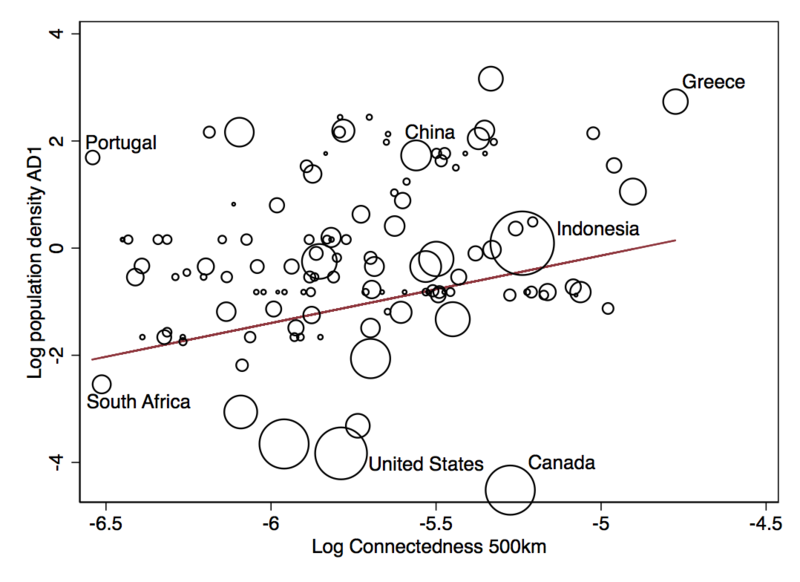 Our results suggest that connectedness and the associated trading opportunities matter for human development. Along the Mediterranean coast, there are more archaeological sites in locations that were better connected over sea, and this relationship emerges most strongly after 1000 BC, when open sea routes were travelled routinely and trade intensified. Once these locational advantages emerged, the favoured locations retained their urban developments over the following centuries. Acemoglu, D, S Johnson, and J Robinson (2005), “The Rise of Europe: Atlantic Trade, Institutional Change, and Economic Growth”, American Economic Review 95: 546-579. Bakker, J D, S E Maurer, J-S Pischke, and F Rauch (2018), “Of Mice and Merchants: Trade and Growth in the Iron Age”, NBER working paper. Bleakley, H and J Lin (2012), “Portage and Path Dependence”, The Quarterly Journal of Economics 127: 587-644. Bosker, M, and E Buringh (2017), “City Seeds: Geography and the Origins of the European City System”, Journal of Urban Economics 98: 139-157. Broodbank, C (2006), “The Origins and Early Development of Mediterranean Maritime Activity”, Journal of Mediterranean Archaeology 19.2: 199-230. Feyrer, F (2009), “Trade and Income--Exploiting Time Series in Geography”, NBER Working Paper 14910. McEvedy, C, and R Jones (1978), Atlas of World Population History, Penguin Books. Michaels, G (2008), "The effect of trade on the demand for skill: Evidence from the interstate highway system." The Review of Economics and Statistics 90(4): 683-701. Michaels, G, and F Rauch (2018), “Resetting the Urban Network: 117-2012”, Economic Journal 128: 378-412. Pascali, L (2017), “The Wind of Change: Maritime Technology, Trade and Economic Development”, American Economic Review 107: 2821-2854. Redding, S J and D M Sturm (2008), “The Costs of Remoteness: Evidence from German Division and Reunification”, American Economic Review 98: 1766-97.